Whatsapp improved in coming up with new features added to the existing features they have. You can now quote your chat message when using whatsapp messenger app. Its fun and interesting using this newly added quote feature. Is your own whatsapp version displaying this quote feature? If no, it means you are still using old whatsapp messenger app. This feature can be seen exactly the moment you select any message in any group or private chat conversations or when you select any media, as if you want to copy it, you will get to see a "reply button" at the very top of your whatsapp chat screen, just displaying. And even as that, you will also get to see other buttons like "Delete button," "Star button" and "forward button" But the one we are interested in for this quote feature, is the one of reply button. Now, having selected your text or media for the quote text, then click on "reply button" the one on top of your whatsapp screen, once you do that, the selected text or media will show up as a preview on top of the text entry box where you will now be able to add your reply. Now, you must have clicked on send button for your message to be sent. After sending, you will get to see your quoted text or message showing inside the group or private chat conversation you used in adding the quote feature. And not only that, the name of the sender which is you, if you are using group chat for example, will show up with a beautified color name, having it attached to the quoted text you sent. As said earlier, if the feature is not yet displaying on your own whatsapp messenger app, it means the version is outdated waiting for it expiry date to come. 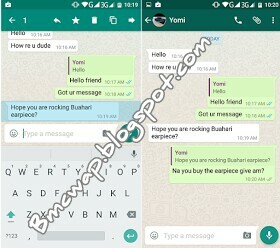 But you can upgrade to the latest version of whatsapp messenger using this link (Click Here to download) Enjoy this feature while we wait for the upcoming whatsapp video chat. Show one the right way and where it is happening life in the world of Tech, by just sharing this post to them using the below share buttons. Thanks.